Around two-thirds of Brits do not think a second Brexit referendum, or so-called “People’s Vote”, is likely. Support for a re-run of the 2016 referendum is only marginally higher among ‘Remain’ voters compared with ‘Leave’ voters, the YouGov poll published Tuesday also revealed. It found that just under a quarter – 24 percent – of people think a second referendum on whether to stay inside or exit the European Union (EU) is likely. In contrast, 63 of respondents felt the second vote is unlikely, despite pro-EU campaigners claiming support is strong. Leave voters are even less inclined to think a second membership referendum is going to happen. Just 14 percent of this group said such a vote is likely compared to 75 percent who do not. Younger Britons are the most expectant that there will be a second referendum, despite the fact the result of the first vote has not even been implemented. Close to a third – 31 percent – of those aged between 18 and 24 years old think it is likely that there will be another public vote. In contrast, as with all other social groups, the majority – 54 percent – do not anticipate a second referendum. 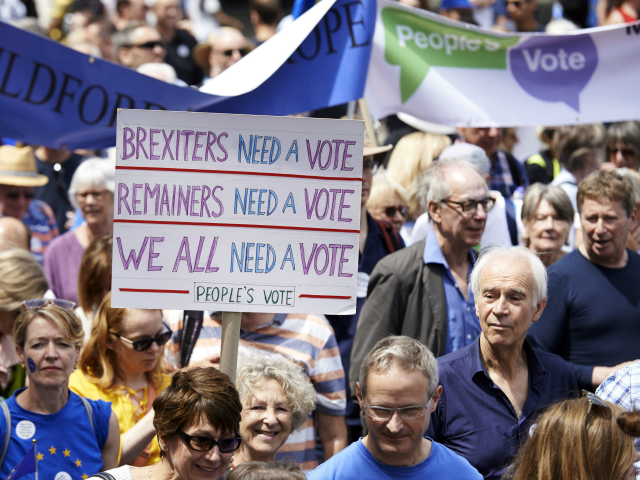 Over the weekend, protesters demanding a second referendum gathered in London for a “People’s Vote march”, with supporters claiming it attracted approximately 700,000 people. Left-wing London Mayor Sadiq Khan was the first to address the crowd in Parliament Square, followed by celebrities and millionaires included Steve Coogan, Delia Smith, and Deborah Meaden. Mr Farage said: “The evidence suggests about a third of those that voted remain now say we’re democrats and think the government should simply get on with it.